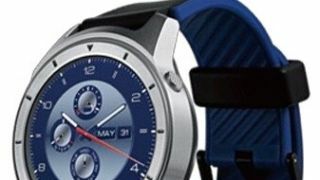 As we inch closer to the expected launch of Android Wear 2.0 [Update: it's out now], a new leak shows off what might be the first ZTE smartwatch to house any version of Google's wearable operating system. The device, dubbed the ZTE Quartz, has manifested in marketing materials provided to noted leaker Evan Blass of VentureBeat. You can see the watch in full below, and know that if the ZTE Quartz is real, it would be the first Android Wear device from the Chinese phone maker. There aren't many details to go on outside of the image - Blass says the materials were still in development and housed few specifics - though it appears the watch will have cellular connectivity, based on an earlier Bluetooth SIG certification. This could mean the Quartz can take and make calls, though that's unconfirmed. ZTE debuted a pair of watches at last year's Mobile World Congress show that were heavy on activity tracking and not much else, but, based on what little we have to go on here, the Quartz looks to flip the script and offer more of what we've come to expect from smartwatches these days. It has a semi-rugged look that's reminiscent of the Casio WSD-F20 unveiled at CES in January (another Android Wear 2.0 watch), though appears stylish enough to wear in the boardroom or at a fancy dinner as well. Blass seems to wink at the possibility of ZTE unveiling the Quartz at MWC 2017, which takes place in just a few weeks. This wouldn't be surprising as a whole crop of watches running Android Wear 2.0 are likely to hit the spotlight then. All will be behind two new watches from LG, the LG Watch Style and LG Watch Sport, which were unveiled right alongside Android Wear 2.0 earlier this week. One last note: you may remember - though probably not - that the company already has a device named Quartz, and it's an Android 4.3 smartphone. Here's hoping the newer Quartz is a little more up with the times.